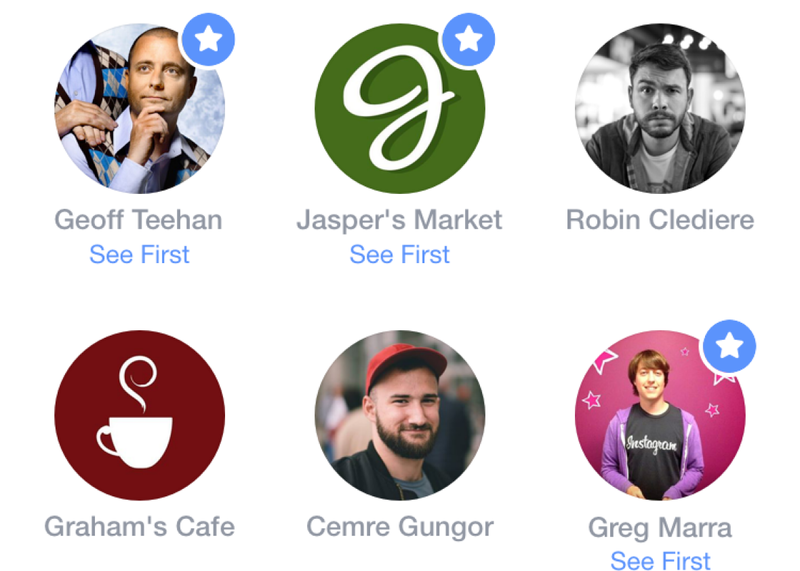 Facebook News Feed: Finally lets you choose which friends' posts to see first. The big complaint about Facebook* has always been that you can’t control what you see in your News Feed. That is finally beginning to change. Facebook announced a new set of options Thursday that will let you specify, among other things, which friends’ posts you’d like to see at the top of your feed when you open the app or website. So if you want to see the latest updates from your best friend, your spouse, and your worst frenemy before you move on to your lesser acquaintances, that’s your prerogative. You can do the same with pages, which means you can now be assured of seeing Slate’s latest updates before you see, let’s say, Salon’s. Speaking of Salon, Facebook’s latest updates also make it much easier to unfollow friends and pages whose posts you’re not interested in anymore. (Just kidding, Salon: Don’t ever change.) Unfollowing people doesn’t defriend them. It just sort of shadow-bans them from your feed, making it a handy way to cut someone out of your online life without getting caught by an app like this one. And you can always refollow them later on, which Facebook has also made easier by creating a special page for all the people you’ve unfollowed in the past. But let’s face it, you probably won’t. You can find the new options in a revamped “preferences” menu, starting Thursday on the iOS app and rolling out to Android and the Web in the next few weeks. 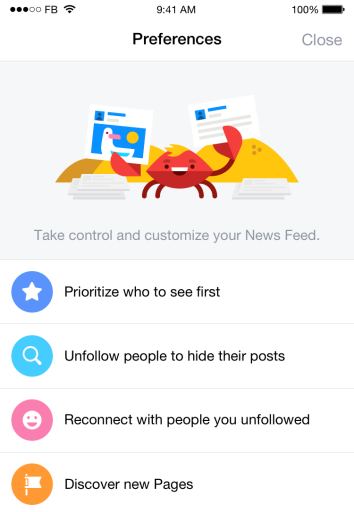 These might seem like relatively minor changes, especially since Facebook already offered ways to unfollow people or highlight certain friends’ posts. But they’re indicative of a fundamental change in Facebook’s philosophy. For years Facebook was convinced that algorithmic ranking was the best way to arrange its users’ News Feeds. It thought that it could learn everything it needed to know about your preferences by observing your online behavior and combining that with its insights into the online behavior of others like you. It thought, in other words, that its software knew what you wanted better than you did. In many ways, it was right. As I’ve detailed in the past, Facebook’s algorithms have evolved over time to maximize user engagement, which it measures by looking at things like clicks, likes, shares, and even the amount of time you spend reading a story before you return to the News Feed. In recent years, however, Facebook has developed a fuller understanding of the limitations of its algorithmic approach. It has recognized that just because you “like” an acquaintance’s engagement announcement doesn’t mean you want to see other acquaintances’ engagement announcements dominating your feed. It has recognized, in other words, that what you “like” isn’t always what you like. And it has recognized that optimizing engagement in the short term isn’t necessarily the path to optimizing engagement in the long term. Up to now, Facebook has tried to address this blind spot in its system through a series of careful tweaks to its data collection and ranking systems. But it has also been forced to acknowledge that its software will never be perfect, and that there are times when you really do know what you want better than Facebook does. Accordingly, it has gradually added little manual fine-tuning mechanisms over time, like a tiny little drop-down arrow at the top right of each post that gives you the option to tell Facebook you’d like to “see fewer posts like this.” These changes have generally been pretty subtle, aimed at giving power users a little more control without scaring or confusing casual users. Forcing people to make too many choices can seriously hinder a social media platform’s growth—just ask Twitter. The options Facebook announced Thursday are unobtrusive in the sense that you won’t see them unless you open the preferences panel. But once you do, they’re front and center in a way that manual controls have rarely been in the past. And if you take advantage of the option to prioritize certain friends in your feed, Facebook will remind you of it every time you log in. Not only will you see those friends’ posts first, they’ll appear with a little blue star next to them to signify that you’ve chosen to place them there. The reason this is such a major step is that the top few posts in your Facebook feed amount to the some of the Internet’s primest real estate. And for the first time, you have the option to control what Facebook puts there. For some people, it may even turn out that the machines were right all along, and manually adjusting the feed actually makes it less fun and engaging. That’s apparently a risk that Facebook is finally willing to take. *Oh, there’s also the complaint that the company is mining all your data to create a hyperdetailed profile of your personal history and online behavior. That one probably isn’t going to change anytime soon.